Identifying the model number of your laptop lcd screen is easy once armed with some basic information. The table below shows popular LCD manufacturers and their corresponding model identifiers. Use the example below to match your model number, you'll also need to look for any suffixes or version numbers to identify the exact model. 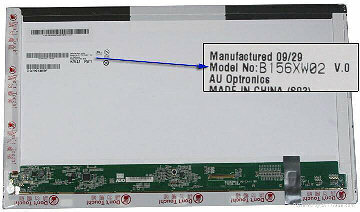 The LCD screen model number will usually be on the back of the screen, sometimes hidden behind a foil covering which may need to be peeled off first.